This concert marks a rare opportunity to hear Rajasthani music from Pakistan with Mai Dhai, a traditional Manganiyar singer and dhol player from the Thar Desert region. 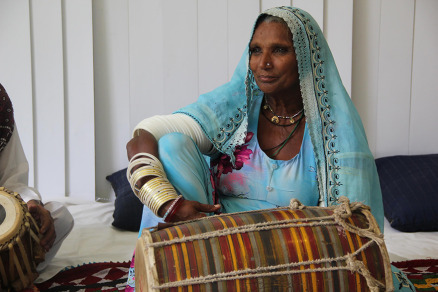 Hailing from Tharparkar, in the interior region of Sindh province, Mai Dhai’s driving percussion and other-worldly voice evoke the ancient rhythms of times long past. The Manganiyars are a caste of Muslim musicians who traditionally performed for the kings of Rajasthan in the subcontinent. Their repertoire ranges from ballads about the kings to Sufi songs written by various mystics as well as songs for occasions such as birth, marriage, rains, and feasts. Even though they are classified as folk musicians, the Manganiyars music is classical and can be considered a root of classical music in the Indian Subcontinent. Dhai will be joined by her ensemble of three on percussion (tabla and dholak) and harmonium.